ARTSFEST SHOWCASE is a dynamic mix of Dance, Music, Comedy, Theatre and Art, and this year’s show won’t disappoint, bringing together home grown performing artists from NH and reaching out to our friends from the Mid-Atlantic States to share their talents with our great state. May 8th’s “2010 Showcase” features SHARP DANCE COMPANY from Philadelphia – a modern thematic performance dance company. SHARP Dance Company brings to the stage modern thematic dance, and will be featuring two exquisite pieces – Blind Faith (part 3) and Woman’s Story (part 2). In “Blind Faith (part 3)” audiences will be inspired by the performance featuring a 34 foot long skirt designed by Brian Strachan revealing the strong helping the weak through trust and faith. In woman’s story (part 2) “A Women’s Quartet” the performance reveals a woman’s ability to overcome personal and social obstacles. “Woman’s Story” empowers and celebrates the vitality, beauty, grace, and individuality of women and how they can and share these strengths with other women in their lives. Formed in 2005 by Diane Sharp-Nachsin, SHARP Dance Company is quickly becoming recognized for their combination of inspired artistry, imagination capturing “stories of performance” and the discipline required of such performance mastery. They feature professionally trained dancers from both the Philadelphia area and some of the Mid-Atlantic States. Their mission is to translate raw human emotion utilizing contemporary movement to connect the audience through individual interpretation. SHARP is a modern dance company, and its theory of “Meaning behind Movement” is showed prominently throughout their work. SHARP feels that dance should be more than a performance; it should be an experience. We at ARTSFEST think you’ll agree your experience will be fantastic, and we are THRILLED to bring them to NH. ARTSFEST performing artists pose for a group shot for their upcoming 2010 showcase May 8th at the Rochester Opera House. 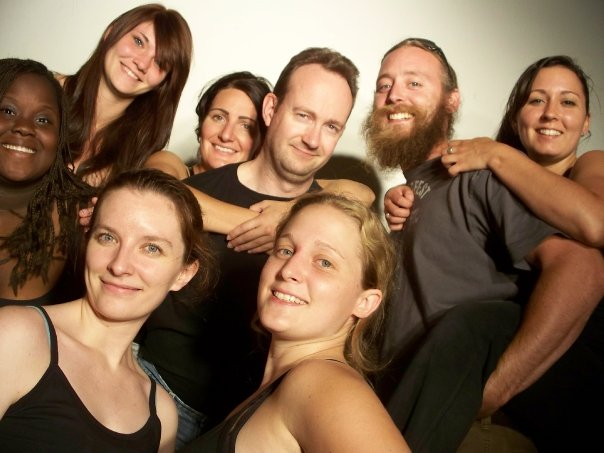 Pictured are (back from left) Simone Henderson, Briana Plume, Alison Henchey, Barry Livingstone, Kevin Borella, Amanda O'Riordan and (front L to R) Rori Dawes and Nicole Buttermore. Tickets are on sale at www.rochesteroperahouse.com or by phone (603) 335-1992. Don't miss this one time only event! Also performing May 8th will be ARTSFEST friends RELEVATION, an original Reggae jam band from NH, featuring their irresistible lively sound that just keeps you moving. Joining SHARP and RELEVATION will be the ARTSFEST DANCE COMPANY, performing their Hip Hop style numbers. They will be joined by their outrageous counterparts, the comedy skits of the ARTSFEST PERFORMING ARTS COMPANY. Tickets ($16-$18) are on sale at Rochester Opera House box office, through the Opera House website (http://www.rochesteroperahouse.com), or via phone (603) 335-1992. The Opera House and ARTSFEST would like to thank major season sponsors Eastern Propane & Oil, L. Wynn Sound, Citadel Broadcasting Corp., Foster’s Daily Democrat, and Holy Rosary Credit Union. You won’t want to miss this incredibly entertaining, one night only, one of a kind performance of professional artists from New England and beyond. This entry was posted on Monday, April 26th, 2010 and is filed under Lakes Region, Performances. You can follow any responses to this entry through RSS 2.0 updated July 26, 2013. You can leave a response, or trackback from your own site.